Minister for Economic Cooperation and Development Dr. Müller at EG Solar e.V. 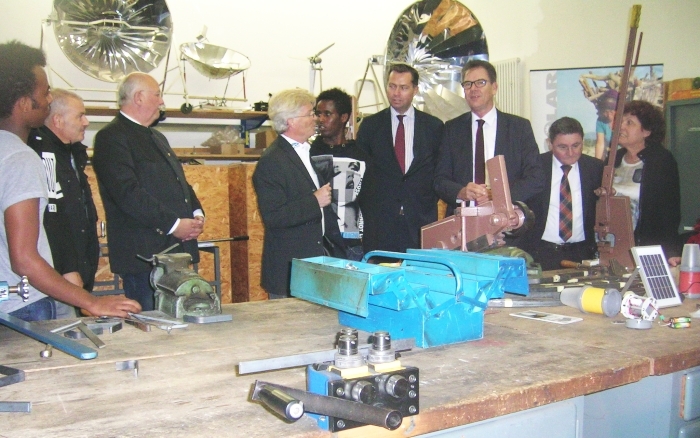 On 13 November 2015, Dr. Bernhard Müller, Federal Minister for Economic Cooperation and Development visited EG Solar e.V.. He came to our county at the invitation of MDB Dr. Stephan Mayer from Neuötting. (See press article Dr. Müller ANA 16.11.2015). Hans Michlbauer took the opportunity to present our development aid concept with solar cookers, wood-saving stoves and solar lamps. He focused on the importance of training in our partner workshops. Escape causes can be combated only if young people have an economic life prospect and an intact environment on site. He referred to the many opportunities for solar cooking in refugee camps. EG Solar has been able to gather positive experiences in 7 refugee camps for Bhutanese refugees in Nepal. 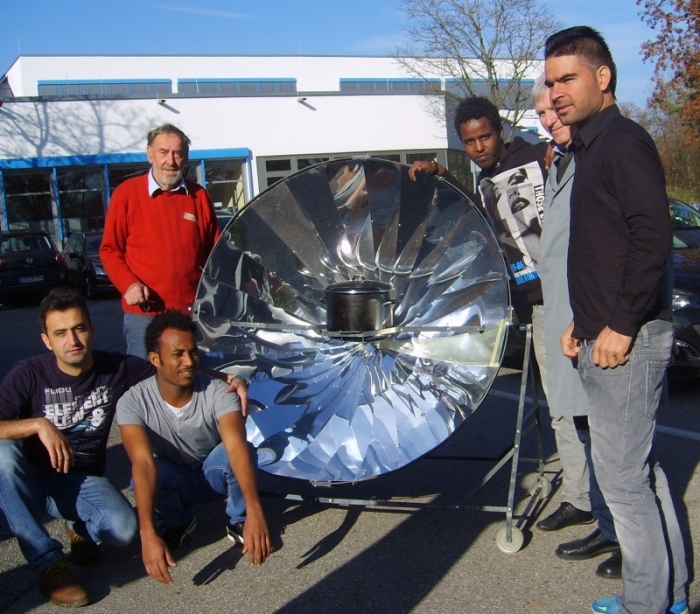 More than 100,000 refugees used some 7,000 solar cookers built in the refugee camps with our support. EG-Solar e.V. would like to provide “help for self-help” in other refugee camps, too. What is missing are partners in the many camps and financial resources. For construction, implementation and support of the 7000 solar cookers in Nepal approx. € 1.5 million were spent. On request, we offer special construction courses for refugees. These courses are subject to special agreements, schedule appointments to be made in consultation with the EG Solar office. In the vocational schools, pupils started a project in which they taught unaccompanied minor refugees in the basics of electrical engineering. Together they built solar lamps. With the help of a learning circle in the field of electrical engineering: In the learning circle – compiled entirely by the pupils – the construction of simple lighting circuits and the electrical safety were taught. Common construction of the Mali-Light, a solar lamp, which can be put to good use in the home of the refugees. The teachers involved were more than enthusiastic about the students and their commitment, especially as some were fully committed despite initial reservation.The graduate class itself was surprised by the interest and iron willingness to learn of the unaccompanied refugees. The refugees themselves were very happy about the deployment of the early specialists. At the same time they have used the opportunity to gain insight into a possible career.